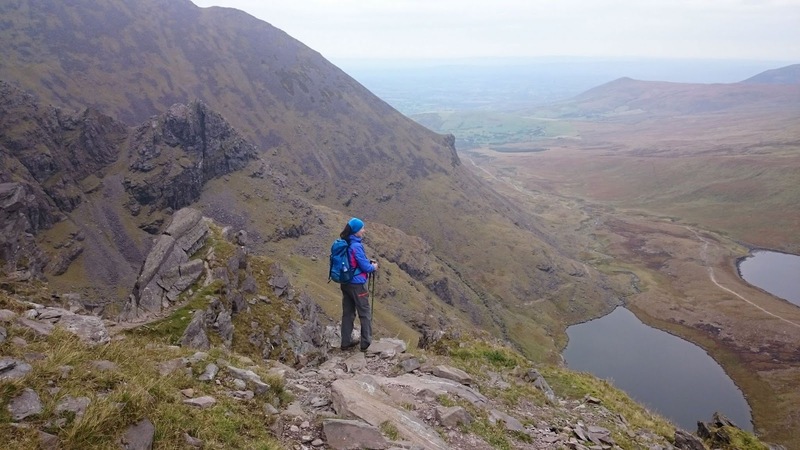 A small group of us went to Carrauntoohil on an absolute glorious day, we went at a leisurely pace where time did not bother us the day was so good. We used the Devil's Ladder route to get to the top, this route is probably the shortest route to the top but one that is not really recommended to use to come back down by because of loose stone and debris and worn paths that are okay to go up. When we got to the top of the Ladder there was hardly a puff of wind blowing with great views and as we headed for the top we looked over our shoulders and there coming up the Ladder behind us was a Cloud right up the Gully which was spectacular. We got to the Top most notable for the fact on such a good day the place was very quiet . Everybody must have been at home watching the World Cup Rugby match vs Argentina. When we were having lunch at the diner, we heard the score. Not Good ! The clear view stretched in all directions from Kenmare to Dingle, North Kerry to over the Border in Cork. Never seen this place so calm and tranquil. To make our visit to the top complete, the famous brown boots had to be photographed on the top of Howling Ridge (again! ), down below the "TURN BACK NOW!" sign. Those boots will yet climb it from Heavenly Gates up to the top someday. And then there was John Cronin singing a Kingdom Song teasing us, replied by Johnny Logans " Whats another Year "
We headed for home by using The Heavenly Gates track. A track that again is a short way home but requires a bit of srambling and sitting on the bum in places especially for a fella with bad knees, thats my excuse. Again there was no great hurry in us the day was so good. The day finished off by a cup of coffee and nice things in the Coffee Shop. A good day out by all.